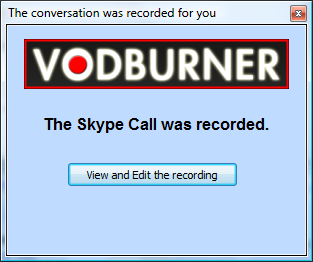 Getting started with the Post-Production Console - Record Skype Video Calls Free with VodBurner! 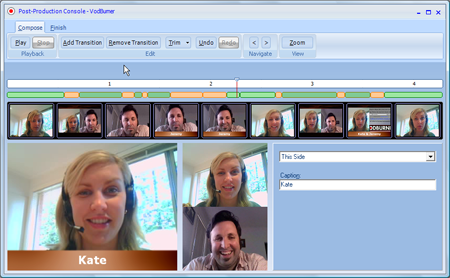 VodBurner records Skype video calls and allows you to edit the recordings to produce a mastered final video. You may decide keep this mastered video file on your hard drive to show family and friends, or you may want to upload to YouTube to share with everyone. 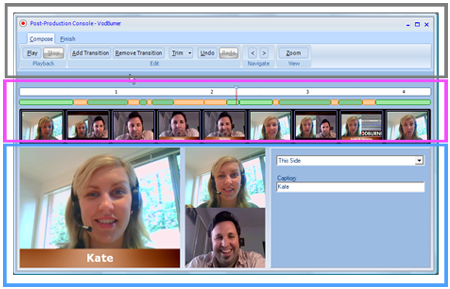 VodBurner has some neat features where you can add subtitles to your videos, trim / delete parts of the video, choose which camera to show and pan back and forth between the cameras, show both people on the Skype video call on a side-by-view etc. To launch the Post-Production Console, click on the “View and Edit the recording” button. Continue on to the next article in this series: Using the Post-Production Console’s Menu Control. Using the Post-Production Console’s Transition Control. Using the Post-Production Console’s Playback Control. Do you have any questions about the Post-Production Console? Contact us. Thanks for this great technology VODBURNER!